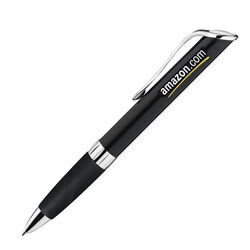 Advertising pens offer small business owners a high interest on a relatively small investment. Promotional pens are not expensive at all. You can find some pretty cool pens that don't cost the earth. These pens often stay on your customer’s desk for days, weeks and even months, serving as a subtle advertisement for your brand. Promotional pens are an effective way to remind customers about your company while at the same time attracting new prospects who have seen the pen. From an advertising perspective one of the biggest benefits of promotional pens is the fact that they are small in size and can be conveniently carried around everywhere by your clients. Every time they take it out to use it, there is a chance that somebody will see and will be curious and want to know more about your company. Another significant feature about advertising pens is that although they are small, they have sufficient space for personalization and can be designed to contain all the important details of your company. With your company name and contact details, anyone who wants to know more about what you offer, will know exactly how to get in touch with you. When you are looking for pens that will serve as an advertisement for your company, you will want to look for pens of high quality. It’s no point gifting someone a cheap pen that will stop writing or will break in a couple of days. Not only will it be binned but it can do a lot of damage to your professional reputation. High quality pens are not that much more expensive and the little extra that you will need to pay is well worth it. If you’ve decided on promotional pens, why not consider novelty pens. Quirky and fun, novelty pens are sure to get you noticed and will help you stay in your customers’ minds much longer than any regular type of pen. 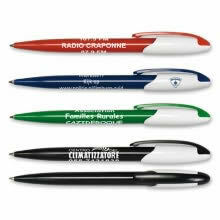 Novelty advertising pens will truly act as a worthy advertisement for your company. Sure, money matters when you are buying any type of corporate gift, whether you are considering giving out pens, coffee mugs or wine glasses. However, that does not mean you should go out and buy the cheapest quality you can find. As I’ve said time and time again, you should never compromise on quality when you are buying promotional items. The good news is that these types of pens are not at all expensive. If you spend some time browsing through the different styles and types available, you will be sure to find something that is just right for you and fits right within your budget too. Also, you will find that almost all companies that deal with corporate gifts will give you a huge discount if you order the pens from them in large quantities. If you are planning on getting the pens personalized (and you should) don’t forget to include that when establishing your budget. I hope that you found this information useful, and that it will help inspire you with ideas for your next promotion or event. If you need further help, advice or would simply like to ask us a question please contact us.